Our portable fans will keep you cool in face of blazing heat. From tiny to enormous, our product range you are guaranteed to find fan units in any size. In addition to outstanding performance they leave an impression with appealing design and first-rate manufacturing. To name an example, industrial fans for professional environments are protected against splashing water and dust. Portable fans describe a variety of fans. The fans differ in terms of construction, functionality and purpose. Portable fans are usually easy to transport from one place to another and are mainly used in the summer. In the winter they are stored away in the attic or storeroom. Some portable fans additionally help recirculate heat in the winter. What kinds of portable fans are there? We divided our portable fans into different subcategories for a better overview of the market and possibilities. 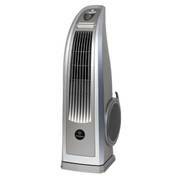 Portable fans include desk fans, pedestal and tower fans, wall-mounted fans and floor fans. 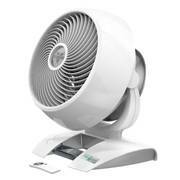 Desk fans usually have a very appealing design and are rather small. 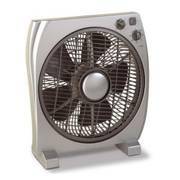 Pedestal fans offer great endurance and high performance. Wall-mounted fans are used for a permanent solution. Floor fans are set up on the ground. Most portable fans are designed for use indoors and in dry environments. Since technical components are made from sensitive material such as copper, fans for outdoor use must be rated with a special IP code that guarantees the device is waterproof and safe. Learn more in our overview of IP codes. If there is no special IP code stated in the description, the fan is suitable for indoor use only. 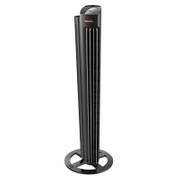 Some pedestal and floor fans can be used in professional environments. Those special fans are much more powerful since they are meant to be applied in industrial factories or on construction sites to accelerate drying of wet materials. 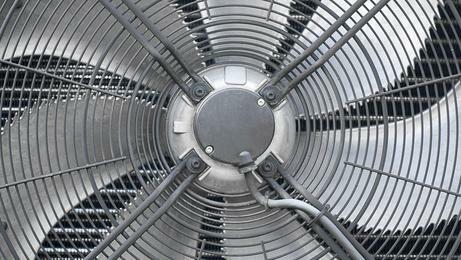 Wind machines and industrial fans are rated with special IP codes for protection against dust and liquid ingress. They are often recognised due to their solid base and small dimensions, the small fans for a desk. There are many different shapes, colours and models, with a retro look, in classi chrome or made of synthetic material. Their performance is indicated with the air flow rate in cubic metres per hour (m³/h) and is based on the rotation speed of the motor and the diameter of the blade wheel, as well as pitch, amount and profile of the blades. It is important to keep in mind that a fancy design is often, but not always, realised at the cost of efficiency. 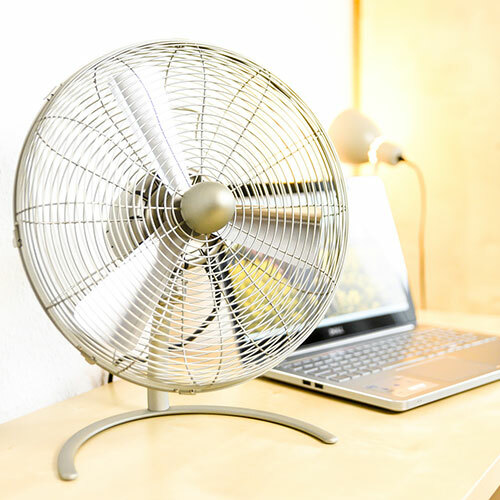 The most affordable size-performance-relation can often be found in simple desk fans made of synthetic material with a blade wheel with several blades and a medium-sized diameter (ca. 30cm). However, aesthetics play a more and more important role when it comes to household and electric devices. This does not go unnoticed and brands try to find a balanced combination of high air flow rate, functionality and innovative design. Thus, more and more desk fans for example have a carry handle on the housing and a stylish control element on the base. Even the useful swiveling feature, also called oscillation, is standard for desk fans and can be switched off and on if needed. Therefore, the cool air masses are evenly distributed throughout the room. ⮩ Our smallest desk fan Zippy can be set up in the tiniest of spaces and can even be held in your hand. The fans that are part of this subcategory are offered in various versions. So-called tower fans are as much part of this as the classic stand fans. 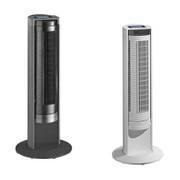 The functionality of the tower fans, however, greatly differs from the pedestal stand fans, even though both of them provide a solid and even air flow. Due to the vertical arrangement of air rollers or drums on the inside the tower fans create an even air flow while operating quietly. Air steering lamellae inside the housing then control the movement of the air mass and distribute it throughout the room. In order to ensure an even distribution, many tower fans have an oscillation feature that swivels the complete outer housing as well as the air steering lamellae from one side to the other. 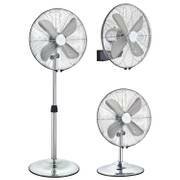 Pedestal fans, however, work with the same principle as desk fans. They have an electrically powered wave that rotates a blade wheel with several blades, thereby sucking in air from the backside of the stand fan and blown out forwards from the fan. The thereby created speed of the air then provides the pleasant cooling effect. Stand fans often possess an optional oscillation feature, too that moves motor, blade wheel and protection grille all together. Everything is usually fastened with a rod that can be adjusted in height and is connected to the solid base. Some models with batteries are also suitable for use outdoors (covered roof). Rated with a special liquid ingress protection they can also be applied in greenhouses. The gentle breeze of pedestal and tower fans actually helps strengthen the plants and promotes growing, while preventing heat spots. However, the delicate inner parts of the fan must be waterproof and protected with an IP code. Portable fans should also be able to cool homes at night. Make sure the fan is not too loud before the purchase. Generally speaking pedestal fans are louder than tower fans. This is due to the sound created by the circulating air mass. Nowadays, producers are working on optimising the design of the blades so that pedestal fans can become more agreeable in terms of noise. 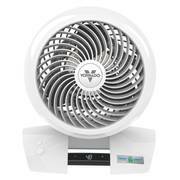 Wall-mounted fans also work with the same principle as desk and pedestal fans. 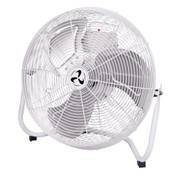 A rotating fan wheel moves the air. However, in contrast to the other kinds, these fans are mounted permanently to the wall. 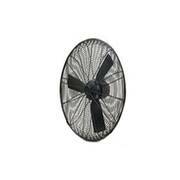 Since the fans are visibly present at all times, our manufacturers attach great value to appealing design. Usually these ventilators are put up in office rooms, restaurants, hotel rooms but also studies or guestrooms at home. Apart from their stylish looks the devices are just as powerful as other portable fans and usually incorporate an oscillation feature. 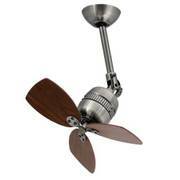 Furthermore, wall-mounted fans are usually less easy to reach because they are mounted near the ceiling. For that reason most producers include a remote control in the box. 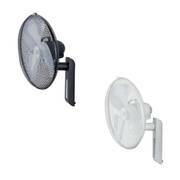 Smaller wall-mounted fans can also be attached temporarily to bars and rods. Particularly photographers, restaurant and business owners are fond of floor fans because they are so easy to move around and store away. 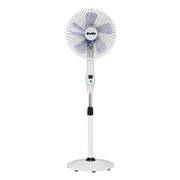 They are easy to use and set up, and operate just like desk fans and pedestal fans. The only difference is where they are set up. These units come with a special frame or foot which secures safe and steady footing. Naturally, you can also decide to put the floor fan on a table or shelf. Sometimes they are used to dry large spaces in construction. Other applications include use in photography studios where they provide a cool wind effect, furthermore they can be seen in bars and club events. They can be used virtually anywhere as long as there is a power supply. Contrary to desk and tower fans the producers of floor fans do not add an oscillation feature. 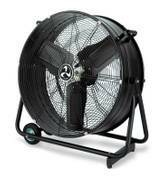 All in all this category of portable fans includes robust and powerful fans for a variety of applications. Box fans and circulators also belong into this category. 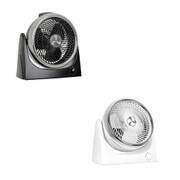 Vornado floor circulators can be used in summer and winter. The oscillating fan head moves air in a three-dimensional way throughout the entire room. The difference between ceiling fans and pedestal fans is not only their design but also their purpose. Ceiling fans are supposed to be used all the year round. It cools in the summer and provides a fresh breeze. In the winter it spins in reverse to force heat from the ceiling down to the ground, preventing a cold floor. This method helps to reduce heating costs. The motion direction is determined by a toggle switch on the motor housing. Recent models also feature a remote control that has settings for summer and winter modes. Portable fans however are mostly used in the summer to provide temporary cooling. Some ceiling fans with an appropriate IP protection rating can be used outdoors or in conservatories. Another subtype is the industrial fan and wind machine. They are used in professional environments independently from the season. Applications include for example construction drying or ventilation in large factory halls. Air is sucked into the fan wheel on one side where it is accelerated and forced out on the other side of the fan. This is basically the same way other portable fans move air. The difference lies in the dimensions. Wind machines are significantly bigger because they need to move a higher volume of air. Due to their airflow rate they are very popular in the industrial sector. Oftentimes wind machines are used in construction drying. They design is functional without any frills and need for pleasing aesthetics. The same goes for industrial fans though they are not quite as powerful as wind machines. Industrial fans tend to be smaller and more similar to free-standing fans. These models are commonly used in photography studios or warehouses. 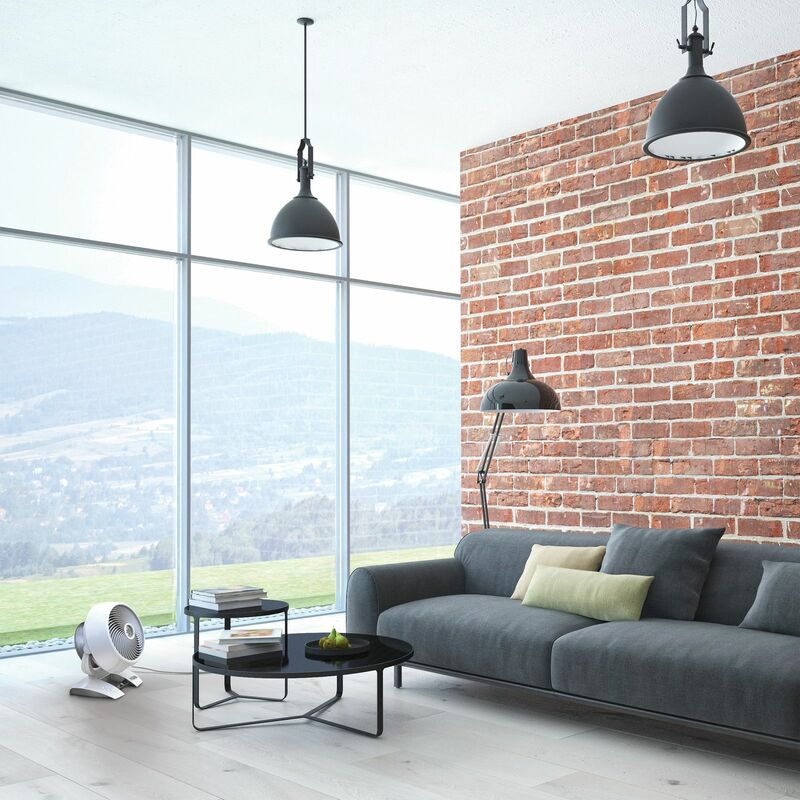 Generally, industrial fans and wind machines are not recommended for use at home because they are simply too big, powerful and loud for a living room or patio. Our portable fans for domestic and professional environments are always on stock and shipped as quickly as possible.